Carlin out ice fishing. Just kidding, that’s Astoria. Carlin Girard is Teton Conservation District’s Water Resource Specialist. You might run into him taking water samples from Fish Creek, measuring suspended sediment on Flat Creek, teaching fourth graders about native fisheries, or at Teton Conservation District while you’re picking up a well test kit. Originally from northwest Massachusetts, Carlin headed west at the age of 18 to attend college in Arizona. After working in Utah, Oregon, and eventually in Jackson for the Wyoming Game and Fish Department for a few years, he went to University of Wyoming for a MS in Aquatic Resource Management. Carlin met his wife, Amy, while working on a field project in Randolph, Utah in 2006. 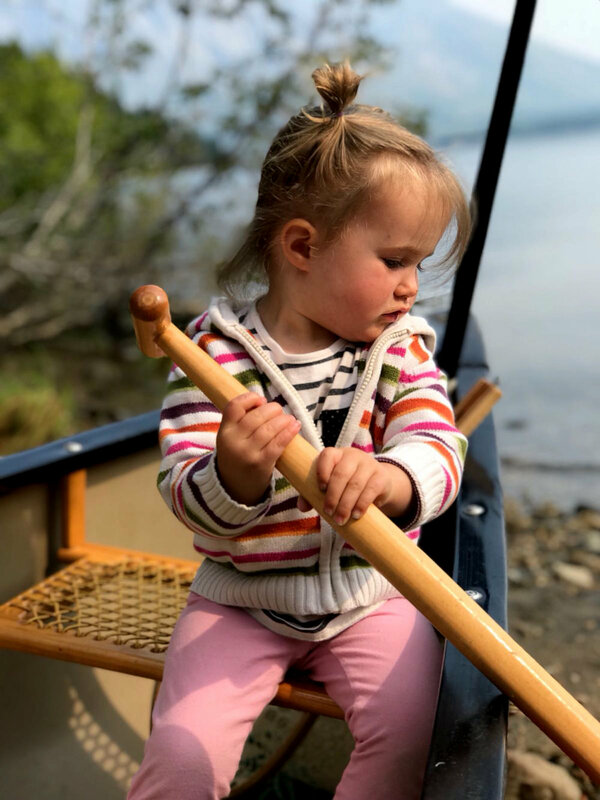 Carlin is teaching their two-year-old daughter, Astoria, to ice fish, ski, and chase off aggressive moose. Carlin is joyful, thoughtful, and just about the coolest staff member we have. If you want to get to know Carlin better, read on. What is the best part of your job at Teton Conservation District? I like that I am able to work on many different water related tasks. I enjoy bouncing between projects because it keeps things interesting for me. I also like the partnership aspect and the mandate that we have to work alongside of other entities. A challenge in my position is that solving the type of problems we are working on takes time. While I am able accept the timeframes for success, these timeframes can be very hard for partners, and those affected by water issues, to accept. I heard you recently published a few academic papers. Can you tell me about them? When I was accepted into my graduate program with the University of Wyoming USGS Cooperative Research Unit, a stipulation was that I publish the findings of my research in peer-reviewed journals. I began my position at TCD before I had even defended my graduate work, let alone received a diploma and published. That meant I had to finish writing my thesis, defend my thesis, and complete two publications on nights and weekends. It didn’t take me long to graduate, but the publications were a different story. The good news is that four and half years later, I have completed all of these requirements. The two papers I published were quite different, although both relate to Oil and Natural Gas Development effects to aquatic ecosystems in the Labarge Oil and Gas Field in Southwest Wyoming. One was focused on fisheries and aquatic habitat. The other was more related to water quality and a comparison of different methods to assess oil and gas related water quality issues. Long answer, but I am proud and relieved to be done. Why did you decide to decide to go to school for/pursue a career in natural resource/water management? Great question, especially if you know me because I have disliked (understatement) school since I was 10 years old. However, I am very passionate about natural resources and knew that a master’s degree would open doors for my career, both in title and because I wanted to improve my analytical skills. Prior to my degree, my work experience was balanced between terrestrial and aquatic sciences. I chose water because it tends to be more unifying and less controversial than wildlife management. Also, my wife has more experience than I do in wildlife fields, and I did not ever want to feel a need to compete with her for jobs. Astoria working on her paddling technique. My greatest achievement is my wonderful little girl. Throughout my life, I have often had jobs that required I work long days, and for hunting and fishing, I often find myself putting the mission before sleep and comfort. But, never has it been so worthwhile to commit so much energy to one thing. I have many passions and I like to stay busy, but for me, my family does come first. My family is great. We get along very well, even though we are very different. My three siblings and mom and dad are extremely supportive of me, and have always encouraged me to think for myself and chart my own course. I do miss them, and even though we only have a small rental here in Jackson, I always prefer when my family is here and staying with us, compared to when they leave and go home. This is true for my mother-in-law as well, and my cousin Luke who is currently living with us until he finds a place of his own. My family are hardworking positive people who have been able to lead happy and productive lives regardless of our financial standing. I think we went through a lot early on, but those hardships helped us keep what is truly important at the forefront of our minds. My wife Amy, two-year-old daughter Astoria, and puppy dog Chihiro are my favorite companions. And, while it isn’t always possible, I wish that we could do everything together. What is the coolest wildlife encounter you’ve had? This is a hard list to choose from, because I have had a lot. But, one experience that stands out in my memory was from the White Mountains in East-Central Arizona. We were on a backpacking trip when we encountered two researchers working on the Mexican Wolf Reintroduction Program. It was during a hail storm and temperatures plummeted. It turns out they had a wolf anaesthetized and were fitting a collar at a remote snare location, and they were very worried about the wolf’s body temperature because it had dropped due to the hail and temperature decrease. They did not have extra clothing to cover it, so they used a flannel shirt of mine. This was the first wolf I had ever seen, but what was so memorable was the very distinct smell that my flannel shirt took on for the remainder of the backpacking trip. Carlin with the okay-sized winter kill he found. And, I have to mention a day of antler hunting when I found two huge winter kills and a backpack load of elk sheds. It almost killed me getting them out. It was just me and my dog and we followed grizzly tracks the entire day. I had taken my bicycle once the road became impassable due to snow. On the way out, my arms were so tired from carrying the skulls over my shoulders that I used my belt to tie them together, then hung my bear spray off of the horns. To get back to my bike, I had to do a pretty good high-water stream crossing. My pants fell right down, and I couldn’t pick them up until I got to the other side. I lashed the skulls to my bike, and pushed it the two miles through drifted snow to my truck. While some might not consider this a wildlife encounter, it was extremely memorable, and I will never forget how alert I was of my surroundings while walking that ridge. Carlin with an okay-sized steelhead. I have many different favorite fish, depending on what you mean. I think my favorite fish to catch are steelhead, which are rainbow trout that are born in rivers and then move into the ocean to grow to adulthood before returning to their natal streams to spawn. They are very majestic, extremely powerful fish, each with their unique travels and life-history. Plus, they are about as big of a fish as you can land on a fly rod in rivers, so they make an excellent challenge. Fishing for steelhead is a lot like hunting, compared to fishing. Halibut are my favorite fish to eat. Although locally, I prefer to eat lake trout because they taste good and are invasive in the Snake River system, so I feel good about keeping them. Maybe reading minds. I think it would be fun. I believe that people think very crazy things, but put strong filters on what they portray to be normal. I know I do at least. I think it would be fun to see what other people are actually thinking.